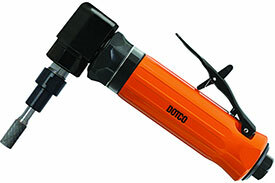 Dotco 10LF Series Right Angle Sander with 300 Series Collet is designed with durable and long lasting aluminum housing. Also featured on the Dotco 10LF Series Right Angle Sander with 300 Series Collet is a wide array of speeds that are suitable for every application. The Dotco 10LF Series Right Angle Sander with 300 Series Collet is available in both front and rear exhaust models. The ergonomic and balanced design on the Dotco 10LF Series Right Angle Sander with 300 Series Collet minimize operator fatigue. Dotco 10LF Series Right Angle Sander with 300 Series Collet are available in a variety of styles and power ratings to provide flexibility in choosing the best tool for the job. Disc sanding and polishing, wire brushes, buffing wheels, abrasive sheets, woven or non-woven belts. No matter the application, Dotco has a quality tool solution. The 10LF200-32 Dotco 10LF Series Right Angle Sander with 300 Series Collet, 1/4'' - 28 Internal Thread is one of thousands of quality tooling products available from MRO Tools. Please browse Dotco 10LF Series Right Angle Sanders with 300 Series Collet for tools similar to the 10LF200-32 Dotco 10LF Series Right Angle Sander with 300 Series Collet, 1/4'' - 28 Internal Thread. 10LF200-32 Dotco 10LF Series Right Angle Sander with 300 Series Collet, 1/4'' - 28 Internal Thread description summary: Dotco 10LF Series Right Angle Sander (Collet NOT Included). Exhaust: Front Termination: 1/4'' - 28 Internal Thread Free Speed (rpm): 12,000 Abrasive Capacity: 3'' Sanding Disc Housing: Aluminum Weight: 1.10lbs Overall Length: 6.6'' Quantity discounts may be available for the 10LF200-32 Dotco 10LF Series Right Angle Sander with 300 Series Collet, 1/4'' - 28 Internal Thread. Please contact MRO Tools for details.